In an almost 10 minute video leaked on YouTube –the video has since gone private— Poker fans got a glimpse of the PokerStars.net Big Game which premieres June 14th on Fox. Air times vary by location, so check your local listings to see when the Big Game will air in your locale. The lineup for the first show features Daniel Neagreanu, Doyle Brunson, Phil Hellmuth, Tony G, Phil Laak, and online qualifier Ernest Wiggins. The show will be hosted by PokerRoad’s Joe Stapleton and Chris Rose –of Best Damn Sports Show fame– who co-hosted Poker Superstars with Howard Lederer. In future episodes Chau Giang, Antonio Esfandiari, Todd Brunson, Scott Seiver, Isaac Haxton, Joe Cada, Vanessa Rousso, Jason mercier, David Williams, Barry Greenstein, Justin Bonomo, Andrew Robl, Lex Veldhuis, Eugene Katchalov, Abe Mosseri, Daniel Alaei, Joe Cassidy, Rick Rahim, Prahlad Friedman, Dani Stern, Jason Calcanis, David Peate and five other “Loose Cannon” online qualifiers will join the cast. Hellmuth won the first hand, and then proceeded to lose the next 3! With the amateur player spiking a King on the second hand; making a 4-card runner-runner flush on the third deal; and finishing it off with another King on the fourth and final deal. As the amateur took in ¾ of the massive pot and exchanged high fives with Daniel Negreanu, Hellmuth, who had been needled the entire game by Tony G, took even more shots from the table, and was visibly shaking. One of the lasting moments of the show will be the look of smug amusement on the face of poker legend Doyle Brunson. 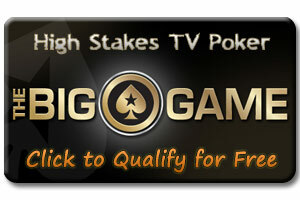 Remember if you are looking to be one of the players at next sessions Big Game to head over to PokerStars and win your seat. This entry was posted on Thursday, June 10th, 2010 at 12:43 pm and is filed under Poker News. You can follow any responses to this entry through the RSS 2.0 feed. You can leave a response, or trackback from your own site.